Black Bean and Mango Salad. It is starting to warm up in our part of the world. This, combined with the fact that our lovely built-in-1951 house does not have air conditioning, means that I am starting to experiment with recipes that don't require any inside heat. 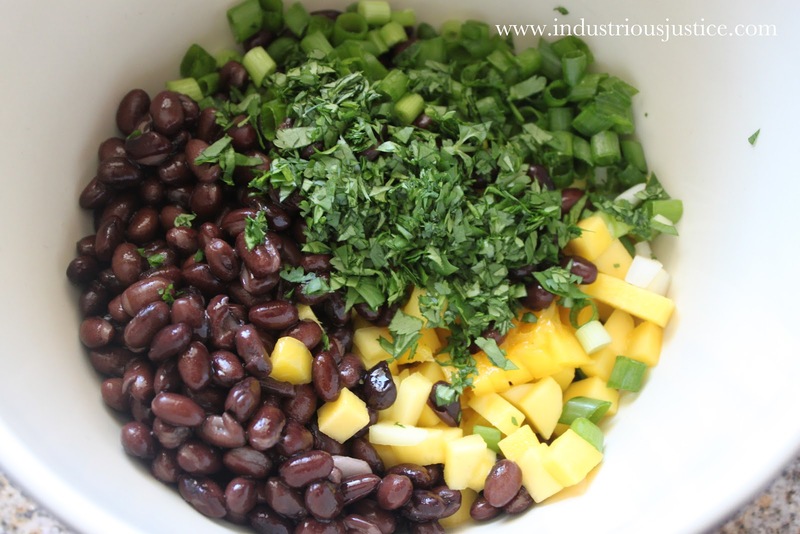 I made this black bean and mango salad yesterday to be served alongside grilled flank steak and chunky guacamole. Easy peasy, healthy, and tasty! Combine all ingredients in a large bowl and stir in combine. Refrigerate before serving. I stuffed some of the salad leftovers into a tortilla with a little pepper jack cheese, grilled it up in a skillet, topped it with salsa, and it made for a delightful lunch. That sounds tasty, Emily. I wonder if it wouldn't be even better with some added crunch-- say from jicama, or red bell pepper or even grilled corn? I recently made a jicama and cabbage slaw with grilled corn and cucumbers, so I'm kind of into jicama right now.